One of the greatest revolutions of the 20th Century is the obvious but often forgotten advancement in mass electronic communication technology. The rather humble telephone, along with devices such as the likes of television, came to dominate the 20th Century. 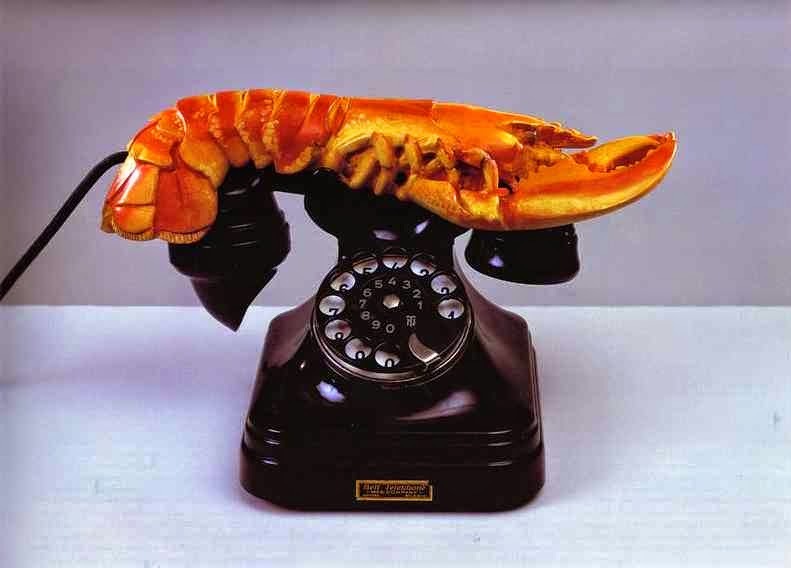 Although the telephone was commercially available in the late 19th Century it took until 1912 before a unified telephone system was available throughout most of Britain with the National Telephone Company providing for over ½ million subscribers. By the early 1930s radio, while in its infancy, emerged nationally; mass television though was still a distant dream, and the internet was not even a vague concept. Thus from the outset, before the emergence of the internet (and other data networks), telecommunications had a simple clear meaning: the telephone and its elder brother, the telegraph. The relative simplicity meant that placing a conventional phone call used what is known as the Public Switched Telephone Network (PSTN), informally known as the Plain Old Telephone Service (POTS) - using copper wires which carried analogue voice data over the dedicated circuits. Described as circuit-switched telephony; the system worked by setting up a dedicated channel (or circuit) between two points for the duration of the call. 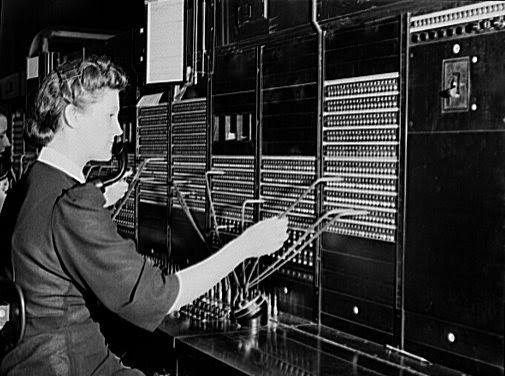 Nothing illustrates this better than images in the early days of telephony showing operators needing to physically connect a call, moving cables from one place to another, as pictured below. The basic principles of telephony endured during 1960s even after the innovation of the modern “fax” pioneered by Xerox and the digitisation of the PSTN. Facsimile sent via the PSTN, adding the ability to communicate documents and data at a distance, was still considered a telecommunications issue because it was still carried over a PSTN. That changed after the 1960's when advances in telecommunications continued with indecent haste aided by significant advancements in computer technology. Thus as a consequence in recent decades electronic communication expanded to include data, video conferencing, e-mail, instant messaging, and web browsing. Telecommunications therefore as concept has also moved away from traditional copper wires to include microwave, terrestrial wireless, satellite and diversification of broadband via mobile phones. The modern industry therefore is far more diverse including not only software-based applications with a communications emphasis but also being suppliers of telecommunications equipment and software products as well as the telecommunications service provider. Ironically the unprecedented relatively recent divergence in the types of electronic media to communicate, via voice, audio, video, or data, has led to a path of convergence of telecommunications hardware. Telecoms architecture has become increasingly integrated. Previously the PSTN, cable, and data networks coexisted as separately owned and operated networks carrying different types of communications. Now most media is increasingly being communicated over a single common network as telecommunications has moved from the traditional circuit-switching to computer based packet-switching. A transition that was probably best epitomised by technology such as Integrated Services Digital Network (ISDN) - which achieved faster dial-up speeds on the traditional circuit switched network before it was killed off by packet switching broadband which led to BT Home Highway being withdrawn in 2007. To give but one example of convergence; the existence of a private telephone exchange (PBX) within a company usually means two separate networks - one for telecoms and one for computer data. This meant two sets of cables and two types of incompatible sockets (RJ45 for network sockets and Type 600 for BT sockets) which would run throughout the building. However with the emergence of Voice over IP as a technology (as popularised by programs such as Skype), which uses packet-switched telephony - voice information travels to its destination in countless individual network packets across the Internet - means voice calls can be transmitted over computer data network. This not only makes voice calls free but eliminates the need for a separate voice network in businesses. This voice/data integration of architecture offers economies of scale in both capital expenditures and operational costs, and also allows different media to work within common applications. Convergence has now meant that both telecoms technology suppliers and service providers are in the business of providing telecommunications in all media simultaneously rather than specializing in a particular type such as voice, video, or data. The increasing technological advances and diversity has been significantly reflected in the continuous development of telecommunications regulation in the UK with government policy makers often struggling to keep up with rapidly evolving technology. Then with privatisation in 1984 we had a regulated duopoly consisting of BT and Cable and Wireless who were able to provide competing telecoms services. In 1991 the existing duopoly in telecoms services was ended and licensing of multiple service providers permitted for domestic service only. International telecommunications remained within the duopoly framework. In 1996 the international duopoly was ended, and other operators were free to offer international services within the UK. Thus we can see that the UK has progressed from a state regulated monopoly in terms of telecoms to one of a myriad of regulated markets. Yet it's not only internal pressures and technological changes that have lead to a diversification of the UK's telecoms regulation. Electronic communication very obviously has worldwide implications and not unsurprisingly is affected by international regulatory bodies notably by governance systems such as the EU, the International Telecommunication Union (ITU) and the Organisation for Economic Cooperation and Development (OECD). The EU for example began "liberalising" the telecoms market in 1990 with Council Directive 90/387/EEC - "the establishment of the internal market for telecommunications services through the implementation of open network provision". This was during a 10 year period leading up to 1998 where the EU imposed on member states, via a series of green papers, directives, and recommendations obligations with respect to equipment markets, regulatory structures, value-added services, and regulation of infrastructure and service competition where it existed. In order to accompany the opening of the sector to competition, the European Commission began the huge task, in 1999, of recasting Europe's regulatory framework for telecommunications. The general aim was to improve access to the information society by striking a balance between regulation of the sector and Europe's competition rules. This regulatory framework for electronic communications is made up of five harmonising directives, focussing in particular on the framework directives, access and interconnection, authorisation, universal service and users rights and protection of privacy. To these were added the Decision of 2002 on radio spectrum policy and the Regulation of 2002 on access to the local loop. By 2003 further European directives removed the need for telecommunication service providers to be licensed by national regulators which in the UK led to several existing regulators merging to form Ofcom via The Communications Act 2003. EU involvement has probably been more immediate to telecoms customers by the privatisation of directory enquires as per EU Directive 2002/77/EC and mobile phone roaming charges within the EU. Thus with the enthusiasm of the EU for increasing political integration, a process which is not yet complete, coupled with international bodies and a multitude of domestic authorities we see a muddled regulatory system that is not only less than ideal but also deeply embedded in the UK. The telecommunications regulator, OFCOM now sits amidst a number of ancillary and overlapping bodies in the United Kingdom, including horizontal or cross-sector regulators which include advertising, competition and data protection. That there are various almost competing regulatory bodies which can intervene at all levels raises concerns about effective coordination and the risks of a lack of transparency. Too many ministries, agencies and authorities inevitably creates a danger of responsibility overlap and blind-spots in the formulation, implementation and oversight of policies. This undoubtedly creates considerable confusion for customers, where awareness is often limited to only to domestic bodies such as the ASA and OFCOM, and perhaps Parliament. EU and International involvement remains hidden as is so often the case. Telecommunications is one of Europe’s most important economic sectors. It's worth around £38.8bn for the UK and €234 billion in total for the EU. Revenues are equivalent to the gross domestic product of a mid-sized country. EU and UK companies have invested in building businesses in every continent and the services they provide, in particular the broadband and wireless infrastructure, are central to many other sectors of the economy and to the daily lives of almost every citizen. Therefore the complexities of European political and regulatory networks present significant challenges when considering Brexit, With this in mind we will be returning in more detail to this subject over the next few blog pieces. Really good article. I remember working in Crossbar exchanges which were an improvement on the original Strowger uniselector units. If you worked nights you could get a scare if a call, erroneously held up for some hours, suddenly cleared and a wave of relays would release - click, click, clunk - across the exchange! IIRC The Crossbar exchange was an American system, and was capable of using DTMF tone dialling. But since we didn't have any phones with that capability, and most of the network was Strowger, ours had no speed advantage, since the entire number had to be laboriously pulse dialled into a register before the call could be set up. EU Referendum: A Free Bet?